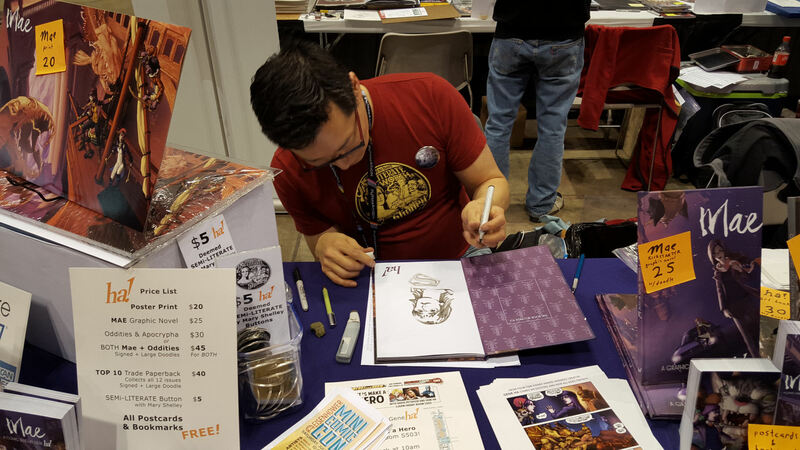 C2E2 2016 Photos, Part 8 of 9: Who We Met and What We Did « Midlife Crisis Crossover! 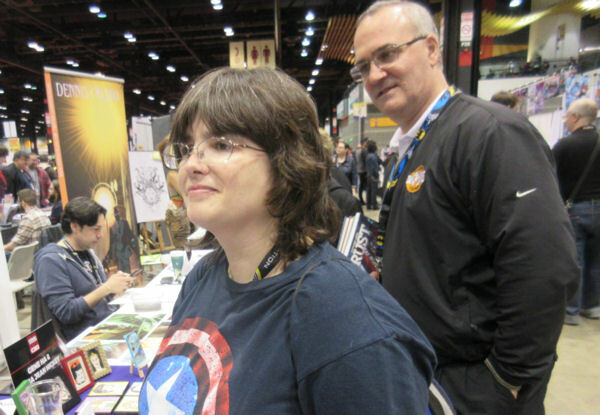 We spent most of our C2E2 time wandering the show floor, perusing the wares and works, buying stuff from writers and artists, and noticing there were dealers but not really doing much for them. The usual boxes and shelves full of $5 trade paperbacks were in shorter supply than usual. With the destruction of my old comics want list in the Great Hard Drive Crash of July 2015, my interest in ’80s back issues has taken a nosedive now that I no longer know or remember what specific singles I’m missing. We stocked up on T-shirts from StylinOnline, SuperHeroStuff, and even the official C2E2 merchandise store, because I’ve never owned a piece of their con merchandise and they finally came up with a shirt design that caught my eye. Fun true story after our shopping experience: when a charge showed up on my wife’s account under the thoroughly generic name “Super Hero Stuff” outside our home state, her credit card company pegged it as possible fraudulent activity and immediately froze her card. This well-intentioned yet uninformed monitoring made for a moment of awkwardness when she tried and failed to buy us lunch Saturday, and had to call them Sunday morning to clear up the matter. We appreciated seeing big-name companies like Marvel, Valiant, and WETA Workshop among the other booths. DC Comics sent creators to represent for them in spirit but once again had no booth. Dark Horse Comics sadly skipped this year, a shame considering they’ve released two books in the last few months that I’d very much love to buy in person from someone someday. Robert Kirkman’s Skybound imprint was in the house, but the rest of Image Comics bowed out after last year’s debut. 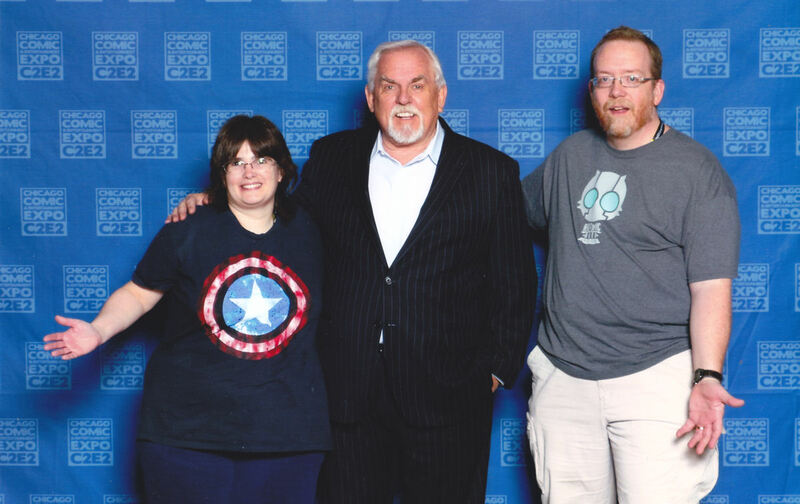 On a smaller scale, we were happy to reunite with a few folks we’d met at previous cons. Matthew Rosenberg, whose super-teen fugitives miniseries We Can Never Go Home was one of my favorite comics of 2015, is currently working his way into DC’s graces and was on hand to promote his next Black Mask Comics project, 4 Kids Walk into a Bank. 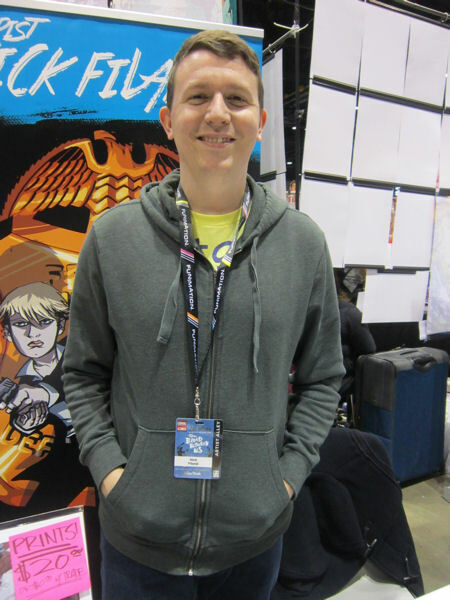 Writer Russell Lissau had more indie projects on hand, including a young-readers’ sci-fi comic called Stranger that looks promising. We stopped by the booth of sci-fi author (and fellow WordPress user!) 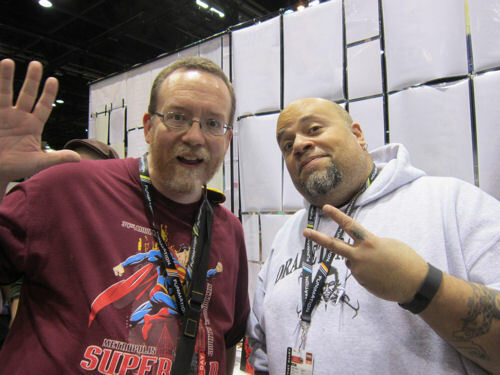 Luther M. Siler, trying out C2E2 for his first time. He’s posted dozens of cosplay pics on his own site along with a candid write-up of his three-day bookselling experience. I’m my head I’m making happy dancing Homer Simpson noises and trying not to geek out too visibly. …and here’s Anne in her first non-paying gig as a geek model, holding very still for several minutes while Mr. Ha captured her likeness. 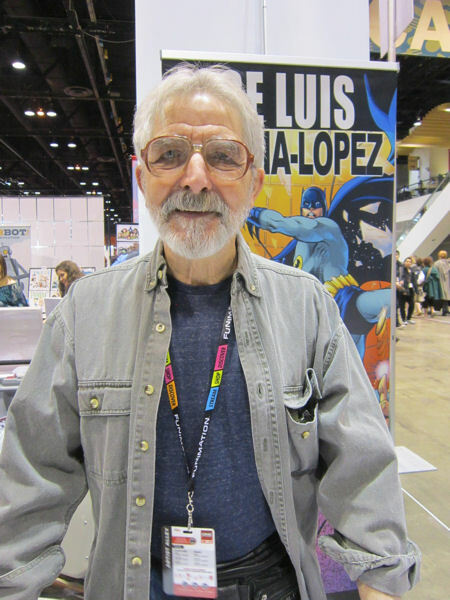 Jose Luis Garcia-Lopez is a huge name to collectors my age, a longtime dependable DC artist with strong, bold linework who’s never been “hot” but always been awesome. I brought my copy of Deadman #1 (early-’80s miniseries) for him to sign. I liked Ming Doyle’s art on the future-soccer superpower miniseries Mara. 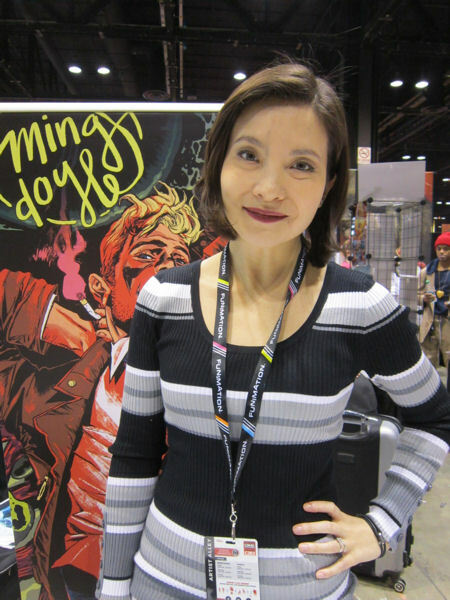 Currently she’s co-writing Constantine the Hellblazer for DC and just finished a Vertigo project about Mob wives called The Kitchen that was among many comics that went largely unordered by our local comic shops last year. David F. Walker, now writing Cyborg for DC and Power Man & Iron Fist for Marvel. Pictured at left: some really white guy. 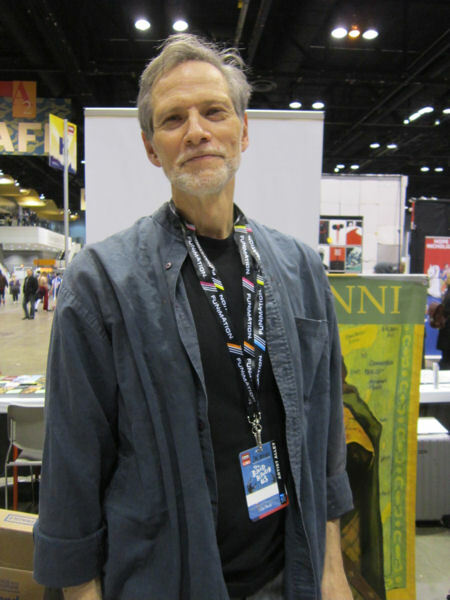 Illustrator Gary Gianni has done a variety of projects for Dark Horse and other publishers over the years. I’ve always been fond of his adaptation of A Christmas Carol he painted long ago for First Comics’ short-lived Classics Illustrated line. Colorist Nick Filardi, whose past credits include Powers, Batman ’66, and Atomic Robo, among dozens of others. His table caught my eye when I noticed he was selling an awesome print of that fiendish halfwit Dr. Dinosaur. 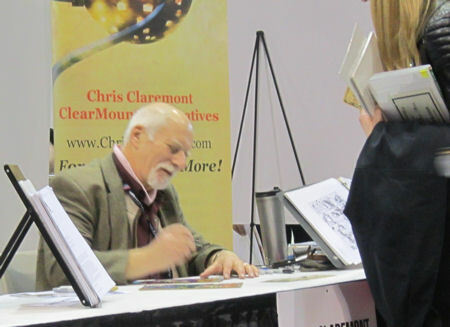 Among the creators we didn’t meet: the legendary Chris Claremont, whose decades at the helm of Uncanny X-Men sparked many a reader’s imagination and provided a solid foundation for today’s steadily improving movie franchise. I wish I could follow up with a long list of panels we attended, but the truth is, of the five Friday comics-related panels I was interested in checking out, four of them conflicted with our two timed-ticket photo-op appointments. I’ll admit I was bummed, but this is what happens when one set of schedules is released farther in advance than the others, and it’s what happens when a con dumps all the most interesting programming into a single, narrow, compacted afternoon. After all appointments were met and I’d finished my first Artists Alley run-through, I insisted on attending one panel late in the day: the annual Silver Age Trivia Challenge! Pictured left to right: moderator Craig Shutt, Mike Chary, Jason Fliegel, Tom Brevoort, Todd Allen, and Mark Waid. I’ve been reading about this event for literally decades, on the rec.arts.comics. * Usenet groups and in Comics Buyer’s Guide back when it was held at the erstwhile “Chicago Comic Con” (now Wizard World Chicago), but never saw one in person till now. Once upon a time, fans and pros formed two teams and faced off in a trivia contest made entirely of questions about Silver Age comics, spanning from the mid-’50s to the early ’70s. 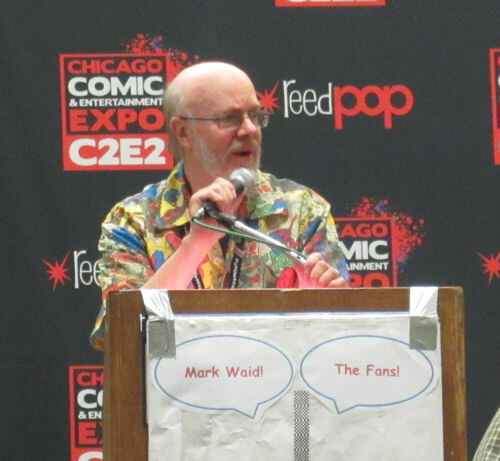 After a while it was noticed that comics writer Mark Waid was basically carrying his team, so the event was restructured and now every year it’s a group of longtime fans vs. just Mark Waid. Half the fun was in watching Waid’s incredulous scoffing whenever the other team got an easy question, and the anguish whenever he missed a question he knew he should know. Our moderator, Craig Shutt, a.k.a. Mr. Silver Age, was once a columnist for CBG and currently has his own forum over at Captain Comics. 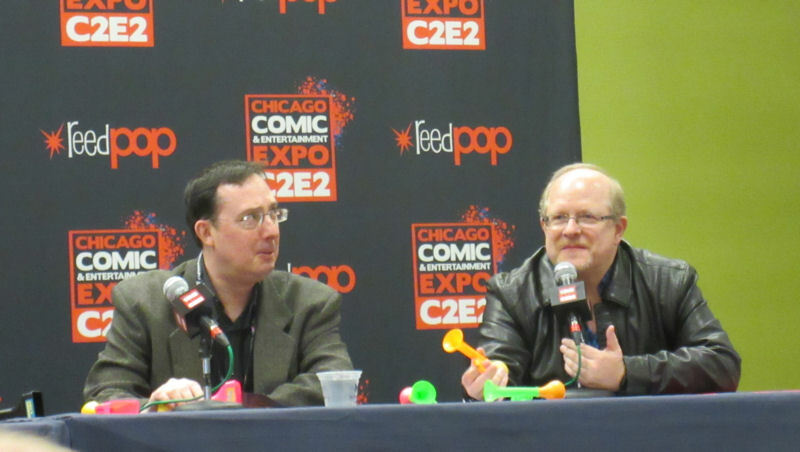 As he used to do in CBG, he’s posted a thorough rundown of the entire event, including all the questions he posed to each team if you want to test your own knowledge of obscure comics or just get a better idea of how truly goofy comics used to be. Mr. Silver Age knows way more about Jimmy Olsen than is healthy for any normal human. Same goes double for Mark Waid, for that matter. Even with the addition to the fans’ team of the skillful Tom Brevoort, Senior VP of Publishing at Marvel Comics, Waid still won for, like, the eighty-seventh consecutive year. The other team tried. They really did. 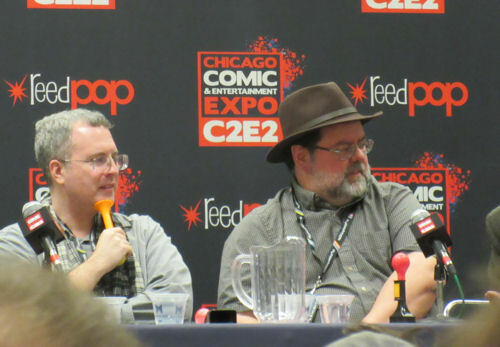 And everyone contributed, not just Brevoort, though Waid had to confess that a few of his zillions of comic-book memories are slowly beginning to fade. It’s conceivable there may come a day when Waid loses the Silver Age Trivia Challenge without dying first. I wouldn’t call it probable, though. Tom Brevoort knows far more about old DC Comics than you’d expect a Marvel editor to know. Likewise, I wish I could say our Saturday was made of comics panels, but the Supergirl experience took up over half our day, and the remaining options for which we did have plenty of time were a lot of not-my-thing, mostly divided as they were into three popular categories: How to Make Some Comics; Hurray for Event Comics I Won’t Be Buying; and Diverse Diversity in Diverse Comics Diversities. It’s extremely cool and encouraging that those platforms and networking opportunities are in there and in greater force than ever before, but I’m not sure the presence of a superfluous straight white prudish Christian guy would add much to the ambiance. I have this mental image of entering a room only to have one or more fans turn with a burning gaze to yell at me, “YOUR KIND HAS MUCH TO ANSWER FOR!” so I tend to buy their comics but sidestep their panels. Otherwise, a lot of our weekend was browsing, shopping, hanging out, and crowd-watching among those with whom we share a lot of touchpoints. Fun times, all told. The view on the escalator ride from the fourth floor to the third. Such loud, very crowd, much color. 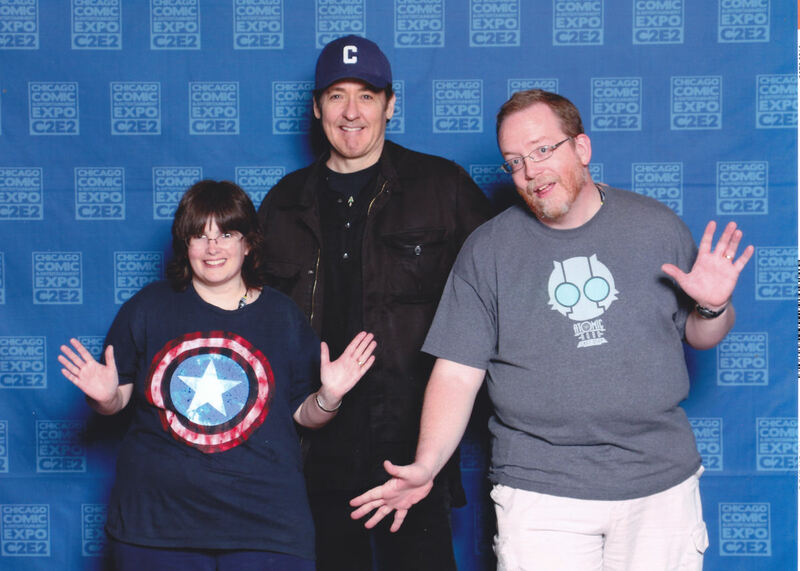 Oh, and about the other photo op we did on Friday: movie star John Cusack, another name dating back to childhood, from the constant cable reruns of One Crazy Summer to the many romantic comedies to the latter-day explosions of Con Air and 2012, with a heartfelt stop in between for High Fidelity, one of the few movies from the last twenty years that I personally, genuinely consider influential. As I understand it, he’s a big fan of Chicago sports teams. Any excuse to travel and come see them in person, I imagine. When we ran into the photo-op booth and asked if we could do jazz hands, he quickly replied, “Uh, you guys can!” And so it goes. * Part 3: We Are Here For Supergirl! * Part 5: Gaming and Animation Costumes! * Part 6: Comics Costumes! 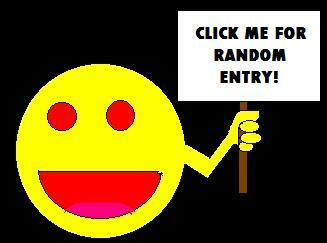 * Part 7: Last Call for Costumes! 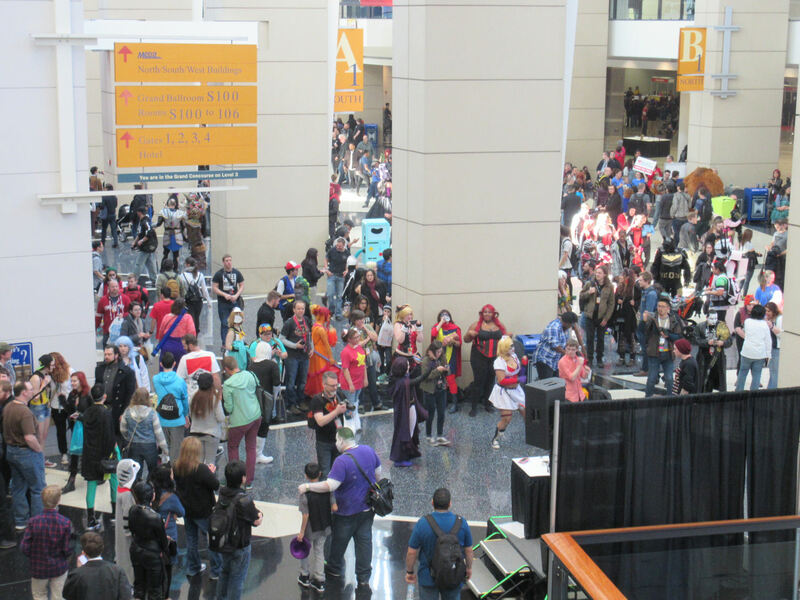 « C2E2 2016 Photos: Last Call for Costumes! That is incredibly cool. Garcia Lopez was my favorite comic book artist as a kid. I spent hours and hours copying panels and covers of his. He did some fantastic work back in the day, and it looks like he’s still got it. I’d never seen him on a con guest list before, so this was HUGE. I almost wish I’d had a speech prepared.